Donald E. Knuth, The Art of Computer Programming, Volume 4A: Combinatorial Algorithms, Part 1. Addison-Wesley, Boston. Jan. 2011. 912 pp. Hardcover, US$74.99. ISBN 0-201-03804-8. A book of algorithms relating to computer programming and their analysis (and about problem solving more generally) would not normally be reviewed in this journal about typesetting and fonts. However, TeX, TUG, and TUGboat would not exist without the problem Knuth faced in 1976 with the the typesetting of the second edition of Volume 2 of The Art of Computer Programming (TAOCP); and thus TAOCP is a key part of the history of the TeX world. Many readers of this journal already know this story (told in chapter 1 of Knuth’s book Digital Typography).1 Addison-Wesley had gotten rid its Monotype technology in 1963 and could not reproduce with the photo-optical machines of the time the high quality typesetting of the original printings Volumes 1–3 (and new printings of Volumes 1 and 3 done with Monotype machines still found in Europe). Consequently, in 1977 Knuth began developing a new typesetting system to restore the high quality typesetting of books, in particular TAOCP. Eventually TeX was available and became popular with various groups of users; and the TeX Users Group and TUGboat came into being. 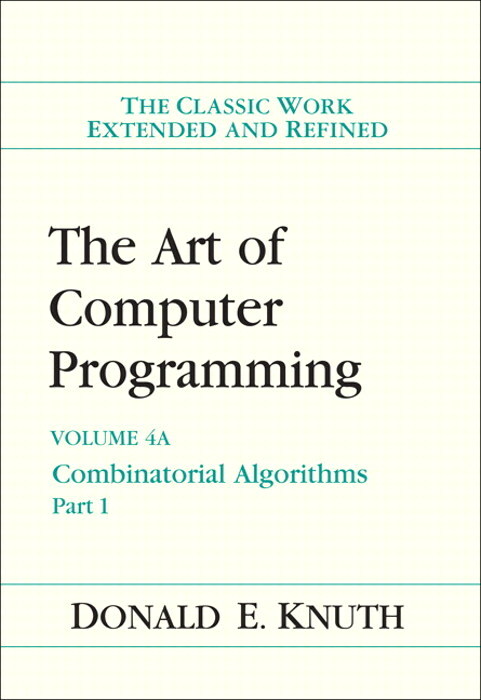 Part 1 (that is, book 1) of Volume 4 (the overall volume is on combinatorial algorithms) covers an Introduction, Zeros and Ones (with four subsections) and Generating All Possibilities (with one subsection containing seven subsubsections). Curiously, the second and third subsections on Generating All Possibilities are not due until Volume 4B. Perhaps at 912 pages (and after publication of the groups of pages from the book over the past half dozen or more years as a succession of five fascicles), Knuth or the publisher decided that Volume 4A was already long enough. As with the previous volumes of TAOCP, this book is substantially about the analysis of the algorithms presented and not just a cookbook of algorithms. A reader can either just find what Knuth says is the best method and use it, or can learn why it is a good method, why other methods are not so good, and how to do the math to analyze the performance of one’s own situations where the algorithms might be used. The book also includes Knuth’s usual sets of exercises and hundreds of pages of answers to exercises. Of the parts of Volume 4A I have touched on so far, I greatly enjoyed the discussion of Latin and Greek squares (the clearest I have ever read), and I know I am going to enjoy reading more of the discussion on bitwise tricks and techniques, a topic that has always fascinated me. I also have looked at some of the resources on Knuth’s web site augmenting discussions in the book (and the reader’s own use of the methods Knuth describes and analyzes). I also enjoy skimming pages of Knuth’s TAOCP, skipping the real math and reading bits of math-and-algorithm history. Section 7.2.1.7, History and further references, looks like it will be particularly fun reading. I never try to work any TAOCP exercises but rather will dip straight into the comprehensive answer sections to find additional information I need that is not covered in the main text. Not being a mathematician myself, I sought out a comment on the book from mathematician (and puzzle master) Bill Gosper2 (who has four entries in the Volume 4A index). Bill’s reply (email of June 3, 2011) is in the sidebar. I am delighted to report that Knuth is still his usual precise, profound, and playful self. The book is surprisingly therapeutic—it will help you lose any guilt you may feel over designing and working puzzles. Has Knuth any idea how many computational resources will now be expended trying to prove him wrong? And on page 464: A technique called “dancing links,” which we will discuss extensively in Section 7.2.2.1, is used here to remove and restore items from and to doubly linked lists. At last, my chance to hear it from the Master! Eagerly flipping forward, …, 7.2.1.6, 7.2.1.7, Answers to Exercises. ARGHH! To Be Continued! And to think I had been salivating over page viii: “(See the discussion of NP-completeness in Section 7.9.)” ! The Table of Contents looks positively meager. How could this require 883 pages? Clue: The Index takes 50 pages. Open to one page at random. Can you plow through it in an hour? A day? This is no cookbook. Don’t open it unless you plan to learn something. 34.4 percent of the book is Answers to Exercises. Volume 4A looks like the previous volumes (in their latest editions)—the same design and great care with details (the Knuthian way). In my memory, some details have evolved since the first edition of Volume 1. For instance, with each new volume and each new edition (maybe even with new printings), including the middle names of cited people and correct presentation of their names in their own language have become ever more complete. In the world of computer historians (i.e., often people who have not been computer professionals themselves), there was some interesting commentary immediately after Volume 4A of TAOCP was published. In essence the question (maybe tongue in cheek) was what took Knuth so long, given how profoundly volumes 1–3 impacted the field of computing—why did he delay this most important work to do other things judged less important by computer historians. The historians may also under-estimate the importance of Knuth’s other work. In my view, Knuth in his field is like Picasso in his. He has had multiple simultaneous and serial careers, any of which would be more than the lifetime achievement of most people. Writing TAOCP is one of Knuth’s most important achievements, but I don’t think it is singularly important. Volume 4A is not such a revolution because Knuth no longer can give comprehensive coverage (and because he already showed us the path to rigorous analysis of algorithms in Volumes 1–3). As Knuth has explained, after volumes 1–3 of TAOCP, the field exploded, and he no longer could do what he set out to do. Nonetheless, Volume 4A is a further example of his stunning ability to understand vast amounts of material, choose interesting parts, and present them in a fascinating way. As noted, Knuth also felt the need to work on digital typesetting so a revision of Volume 2 of TAOCP would not look bad to him. In so doing, he revolutionized digital typesetting and font design. This incidentally gave many mathematicians, physicists, economists, etc., a new way to do their writing and began what is probably the longest running open source software success story. Over the years the breadth of use of TeX et al. has continued to grow (critical editions of literature, non-Latin alphabet writing, etc. ), even as commercial typesetting systems with their GUI interfaces have become the norm in the population at large (with these commercial systems gradually adopting most of the algorithms TeX had long ago). Some might argue that TeX and Knuth’s investigations into digital typesetting and font design have had more impact on the world than Knuth’s self-proclaimed masterwork, TAOCP. It also may be that, after the first three volumes of TAOCP, Knuth had to regroup to ready himself for the next step in the series. He wrote two books organizing and extending the math approach to analysis of algorithm: one with Daniel Green [Mathematics for the Analysis of Algorithms, third edition, Birkhäuser, 1990], and one with Ronald Graham and Oren Patashnik [Concrete Mathematics, second edition, Addison-Wesley, 1994]. He created a new, modern hypothetical machine to use for his examples and wrote the book about the machine [MMIXware: A RISC Computer for the Third Millennium, Springer-Verlag, 1999]. He created the Stanford GraphBase system to help with combinatorics problems and wrote the book [The Stanford GraphBase: A Platform for Combinatorial Computing, ACM Press, 1994]. which he is now never going to get to. He brought out the most recent of these volumes in late 2010. Of course, he also developed the concept of literate programming and the software to compile and document large systems such as TeX [The CWEB System of Structured Documentation, with Silvio Levy, Addison-Wesley, 1993]. My admiration for Knuth is unbounded. Volume 4A is another stunning example of Knuth’s breadth, thoroughness, and desire to produce a beautiful book. As a purely personal matter, I adopted the use of TeX-based systems when I made the decision in the 1990s to stop using word processing systems with graphical user interfaces. I chose TeX as my replacement word processing system because of my admiration for Knuth and the desire to use something he had created. I haven’t been disappointed. More generally, I stand by my comparison with Picasso. Knuth is as much an artist as he is a technician. He goes where his muse takes him and he does so with unmatched (for the computer field) skill, care, depth, breadth, and artistry. We in the TeX community remain major benefactors of Knuth’s skill and artistry. For someone like me who still feels a strong connection to the world of computer programming, there is another thing to marvel at regarding Knuth. He is perhaps unique as a person of his stature as a theoretician for how many lines of code he apparently still writes every day. For Knuth programming is an art he practices every day.